For all you that have read the article on "Handbag Undies" this is the perfect accessory for you is the multipurpose pouch. The pouch is perfect for all your everyday needs and some. The large one is long enough to hold a few pens and pencils, maybe some makeup. I don't know about you, but how often do you find yourself looking for a pen to fill out a check while you are in a store?? The large multi is the perfect size for carrying your checkbook and pen. The small multi pouch holds are your small daily essentials, your credit cards and some cash. I always have a few in my possession to hold my many coupons for the grocery store and those "shopper's club cards". Come by my website and my store to see all the different colors there are. I am sure you will find one that you love. 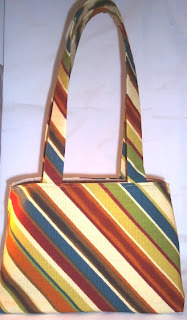 As always, I can do a custom one to match any of the bags online, all you have to do is ask! Thank you all for stopping by my page and giving much appreciated feedback. I have been trying to keep it up making changes on the website, and will continue to update my page. Please continue to stop by my website and let me know if there are any areas for improvement. I'd like to keep my site updated and fresh and the only way to acheive this is to ask the customer, right? Thank you all for your comment, criticisms and support. Now down to business. There were alot of entries, but there could only be one winner. I was surprised to see a BBWO member was picked. She's a wonderful artist that designs hand drawn cards. If you haven't already, you must stop by Pamela Council's store and check out all she has to offer. Congrat's Pamela and thanks again to all who stopped by and gave advice!! DO YOU HAVE HANDBAG UNDIES? Did you know that there is a proper way to carry a handbag? Well as we all know there is a right and a wrong way of doing everything... right? Well, this includes handbag carrying too! Allow me to give a series of lectures in handbag carrying 101. 1. DON'T BE A BAG DUMPER! I've seen many women at the check out stand of a grocery store and/or department store "digging for gold" at the bottom of their bag when it's time to give change. I've even seen girlfriends receive change from a cashier and just "dump" the change in the bottom of their handbag. One of the worst, is the sistah who "dump" and allow uncovered ink pens to roam around her bag and mark up everything it touches... including her cash. But the dumper who should receive a lifetime sentence to carrying a fanny pack (lol) is the sistah who dumps her cosmetics! LADIES... STOP!!!! THIS IS SO UN-DIVA! All of the above mentioned violations can and will be stopped.Did you know that properly carrying a handbag can save money, time, and stress? First, let me tell you how proper handbag carrying can save money.1. Get a coin pouch!Keeping your change in a coin pouch, saves time, money and energy! The coin pouch is a women's triple threat. Knowing where your change is allows you to whip out exact change to that impatient cashier and keeps you from having to turn around and tell the waiting customers behind you a thing or two about patience. Coin pouches saves money because at the end of the year if you keep all your change, you will have close to $400 saved. 2. Keep up with the tops to those ink pens! Keeping your ink pens covered, helps the bottom of your bags to remain spotless. You should utilize the side zipper for your phone, ink pen, and keys at all times. Nobody likes the stress of searching for a ringing phone or car keys on a rainy or dark night. Using your side zipper will help keep your stress level down and save time as well. Coincidently, you'll also same money because we all know, time is also money... right! 3. Conceal your concealer... and lipstick... and eye shadow oh my! How many eye shadows have you had to replace because you dumped it in the bottom of you bag, and it broke into a million pieces? How many eyeliners have you replaced because you thought you were out, but in actuality, you dumped it in the bottom of purse #1021 of 3500 in your closet? This is another triple threat! By having two things... ONE spot for all of your cosmetics (a vanity, or a shelf in your linen closet) and a cosmetic bag which holds ONLY the cosmetics you are wearing for that day, you save both money and time. You save money because you have a better since of inventory control, you save time because once again... you eliminate countless search time. You will definitely spend less time stressing over where that M.A.C chestnut lip liner is! Properly carrying a handbag is not just about rather you choose to drape the strap over your shoulder or in the crease of your arm. How you choose to carry your handbag on the outside is clear. However, if I asked you for $1.93 exactly, how long would it take you to give it to me? If I asked you do see the pot your eye shadow you're wearing looks like, would you be too ashamed to let me see it? A true diva takes pride in what you see and don't see. What's in your handbag is a lot like underwear.... Though it may be unseen, it is still a reflection of who you are.